Provincial Curia, QUEZON CITY – With spiritual depth and simplicity, the 250th jubilee of the arrival of the Augustinian Recollect missionaries in the island of Bohol was celebrated simultaneously on August 18 and 19, 2018 in the different parishes of the province. Fray Dionisio Selma, OAR, Prior Provincial, led the group of 17 Recoletos friars, majority of whom were Boholanos, in marking this grand milestone through a concelebrated mass, propagation of the devotion to St. Ezekiel Moreno, and vocation campaign. 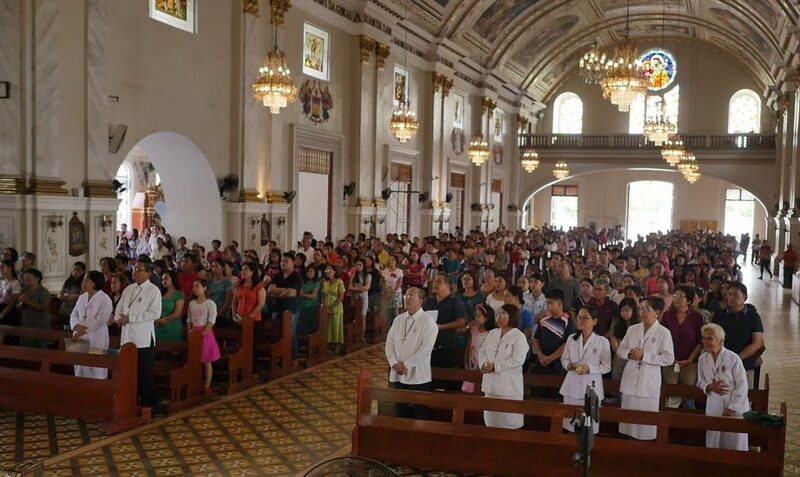 The two-day celebration was also meant to highlight the significance of 2018 as the “Year of the Clergy and Consecrated Persons” in the Philippine Church and the OAR “Year of Youth, Faith and Vocation Discernment.” Likewise, it also served as part of the preparation for the Fifth Centenary of the coming of Christianity in the archipelago in 2021. The OAR priests were all distributed to the nine (9) parish churches, including the two cathedrals, where, except for Talibon, the pioneer missionaries had been assigned at the wake of the expulsion of the Jesuits in 1768. The other churches were in Tagbilaran, Jagna, Loboc, Dauis, Loay, Baclayon, Loon, and Maribojoc. Although Inabanga was among the first nine parishes entrusted to the Recollects, some circumstances prompted the committee to transfer instead the celebration to the cathedral in Talibon which used to be just a “visita” (barrio/chapel) of the 17th-century St. Paul the Apostle Parish of Inabanga. With the theme, “Pagpasalamat sa Mabungahong Pagsangyaw sa Ebanghelyo sa Isla sa Bohol” (“Gratitude for a Fruitful Evangelization in the Island of Bohol”), the celebrations were decidedly made to coincide on the solemn feast of St. Ezekiel Moreno, patron saint of the fourth Province of the Order of Augustinian Recollects. When King Charles III’s Royal Decree suppressing and expelling the Society of Jesus from the Spanish colonies—hence, from their mission stations—took effect in the Philippine islands in 1768, Bohol was handed over to the Recoletos. Between July and November of that year, the first batch successively arrived and were to take charge of the nine parishes earlier established by the Jesuits. It was composed of eight friars headed by Fray Pedro de Sta. Barbara (Loboc) and appointed Vicar Provincial of Bohol island. Other appointments included Fray Isidro de la Concepción (Tagbilaran), Fray Juan de San Ignacio de Loyola (Loay), Fray José de Santa Orosia (Dauis), Fray Nicolás de la Asunción (Jagna), Fray Julián de Sta. Ana (Baclayon), Fray Manuel de la Consolación (Loon), and Fray Carlos de San Miguel (Inabanga). The ninth missionary, Fray Carlos de San Miguel who was destined for Inabanga, died two months earlier in his parish assignment in Masbate. Aside from the famed Dagohoy Rebellion (1744-1829), the various tragedies and calamities that had befallen the inhabitants within the decades of Recollect mission works in Bohol gave a real touch of pastoral challenge to these new group of missionaries. After this “interim hiatus [of] five years and seven months,” the Recollects came back in 1904 to successively administer six vacant parishes of Mabini, Valencia, Candijay, Clarin, Duero, and Guindulman. Throughout the span of 169 years (1768-1937) in Bohol, the Recollects were able to establish 27 new towns/parishes: Cortes (1793), Guindulman (1798), Loay (1799), Calape (1802), Panglao (1803), Balilihan (1829), Talibon (1831), Bilar (1831), Catigbian (1848), Ipil (1850), Tubigon (1852), Candijay (1857), Garcia-Hernandez (1858), Duero (1869), Sierra Bullones (1863), Lila (1868), Alburquerque (1868), Valencia (1870), Sevilla (1872), Carmen (1872), Jetafe (1875), Ubay (1876), Antequera (1880), Corella (1884), Anda (1885), Mabini (1905), and Clarin (1922). Today, Bohol is now jurisdictionally divided into two Roman Catholic Dioceses: that of Tagbilaran which was created on November 8, 1941 and that of Talibon, on January 9, 1986. “There was a semblance of how history was repeated,” remarked one of the friars who documented the recent events dubbed as “Bohol 250” but he pointed out that it could be the modernized version. Those two Recollect friars were Frays Emeterio Buñao and Dominador Mercado, Jr. Additionally, the third Boholano Recollect who did not also make it to the celebration due to conflict of schedule was Fray Roweno Eugenio Hamo. 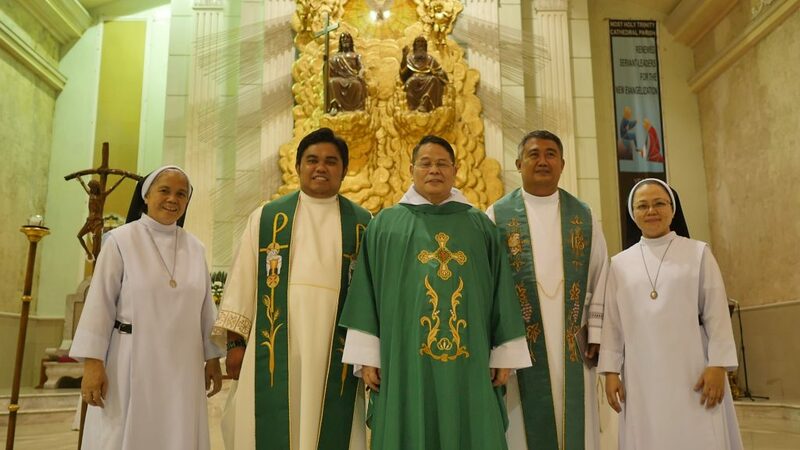 As a member of the newly-formed Recoletos de Caidicoan community in Valencia, Negros Oriental, he had to be present during the installation of his confrere as the new Priest in-charge of the St. Ezekiel Moreno Chaplaincy on August 19. But being as resilient to the inevitable as their predecessors, the Recollect Fathers were able to make swift adjustments just so they could cover the nine parishes as earlier scheduled. The 5:30 PM mass of August 18 at St. Joseph Cathedral was presided over by Fr. Ramon Ongcog, the parochial vicar. Frays Amadeo Lucero gave the homily. Frays Domingo Saladaga and Leander Barrot stood as concelebrants. After the mass, the rite of healing which was officiated imploring the intercession of St. Ezekiel Moreno, followed. On August 18, at the Most Holy Trinity Cathedral in Talibon, the Prior Provincial, Fray Dionisio Selma, presided the 5:00 PM mass which started with the reception and enthronement of the image of St. Ezekiel Moreno. Fray Albert Pellazar together with the three diocesan priests of the parish—Msgr. Ariel Lantaca, Fr. Jude Marvin Gumapac, and Fr. Jeffrey Camargo—concelebrated, and assisted in the post-missam healing rite. The next day, August 19, Most Rev. 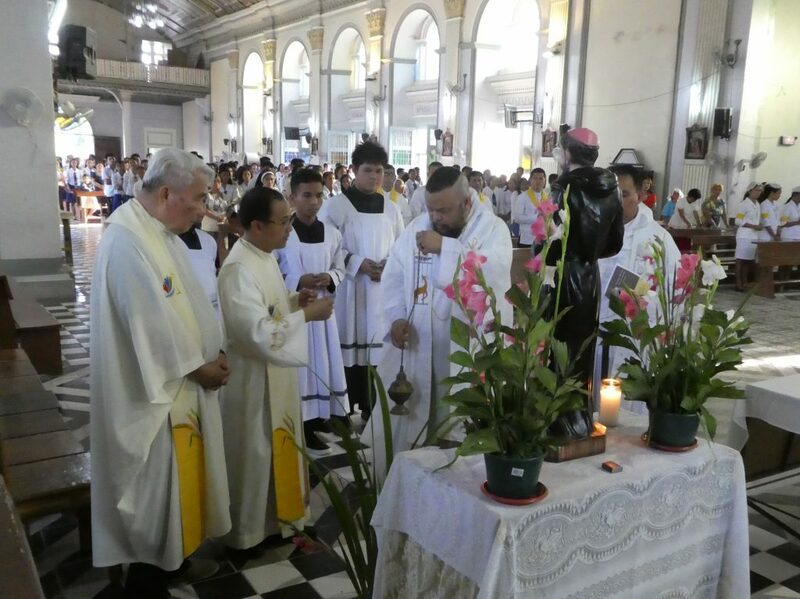 Daniel Patrick Parcon, bishop of Talibon presided the 8:30 AM concelebrated mass with the two Recollects, Fray Amadeo Lucero and Leander Barrot, concelebrating. Fray Lucero gave the homily. Frays Vicente Cadeliña and Urbano Galanido, both natives of this burgeoning town, were assigned to celebrate the thanksgiving mass in the former Recollect parish church which is under the patronage of St. Michael the Archangel. Fray Cadeliña was the presider and homilist of the 5:00 PM mass on August 18 with Fray Galanido and two diocesan priests—Msgr. Orencio Jubac and Fr. Tereso Lumacang, Jr., parochial vicar, as concelebrants. But the following day, August 19, only Fray Galanido remained to preside the 10:00 AM mass as Fray Cadeliña had to assist in Baclayon church. The 5:00 PM mass on August 18 at St. Peter the Apostle Parish Church was presided by Fray Edgar Tubio (replacing Fray Buñao who was not able to come) with Fray Invenzor Melgazo and Fr. Al John Minoza, the parish priest, as concelebrants. 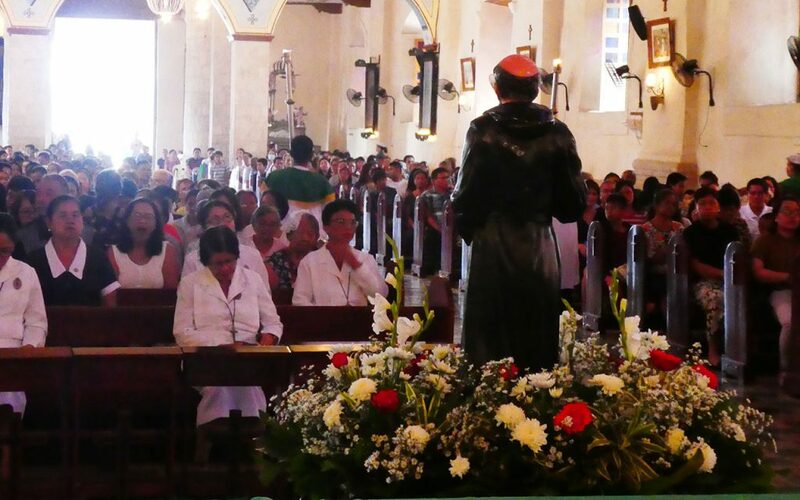 Just like in other parishes, they also refreshed the people of the role of the Recoletos in the evangelization of Bohol, introduced the devotion to St. Ezekiel Moreno and performed, after the mass, the healing rite. On August 19, only Fray Invenzor Melgazo was left alone to preside the scheduled 8:30 AM mass in the parish church. In fact, the parish priest requested him to take also the 6:30 AM mass for two reasons: that the devotion to St. Ezekiel may be disseminated to others and that he (parish priest) could say mass in the barrio chapels. Fray Tubio was scheduled to be in Dauis. Fray Jerome Virtudazo celebrated the 4:30 PM of August 18 mass at the Assumption of Our Lady Parish church. During the reception and enthronement of St. Ezekiel’s image, the Knights of Columbus represented the parish since the parish priest and his companions had prior commitments. Fray Edgar Tubio who was in Loboc that afternoon should have been his companion. As originally scheduled, Fray Tubio celebrated the 6:30 AM mass of August 19. “I chose Dauis ahead of others because it was there where I was baptized,” he said. 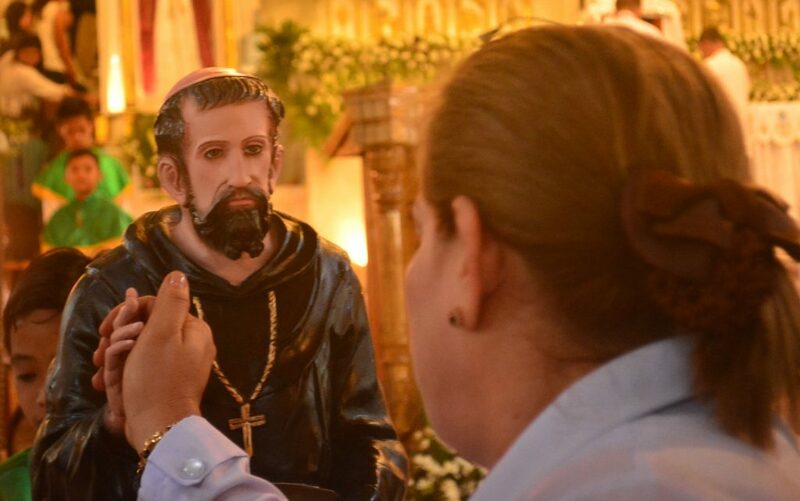 “And it was the first time that I had celebrated mass there ever since.” His companion, Fray Virtudazo, had to be in Maribojoc that same morning. At 6:00 PM of August 18, the trio Frays Joseph Granada, Bernard Amparado, and Nelson Plohimon together with Fr. Gerardo Salise, parish priest, and Fr. Ryan Montealto, parochial vicar, celebrated the mass at the Most Holy Trinity Parish church. Fray Plohimon was the main celebrant while Fray Amparado was the homilist. “It was a well prepared celebration as truckloads of mass-goers from different chapel areas came. People were interested especially with the healing rite,” Fray Plohimon attested. On August 19, only Fray Granada celebrated the 8:30 AM mass in the said church since Frays Amparado and Plohimon had to return to their respective communities for their celebration. 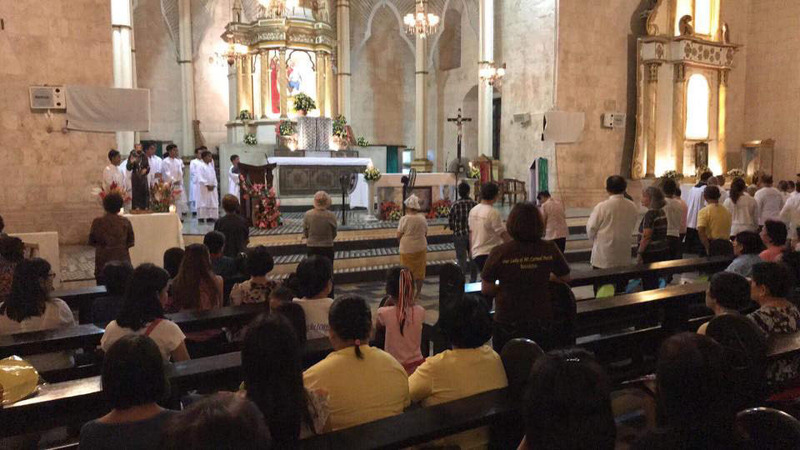 No mass was scheduled on August 18 at the Immaculate Conception of the Virgin Mary Parish. 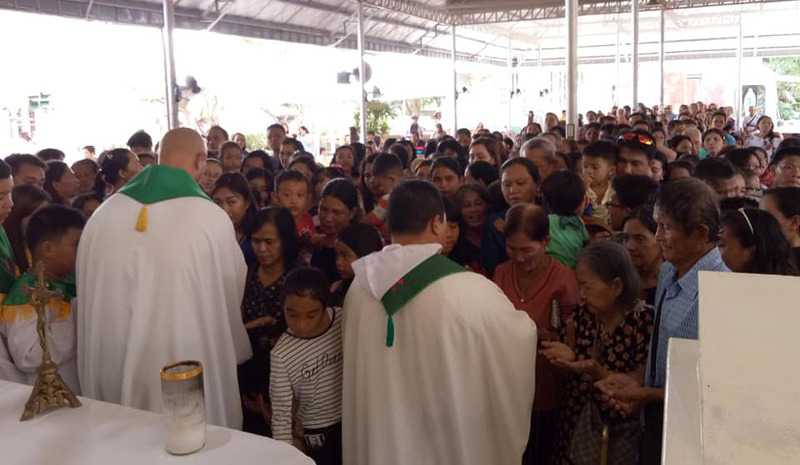 But, on August 19, at 8:00 AM, Fray Constantino Real and Vicente Cadeliña (who took the place of Fray Mercado who failed to arrive due to airport problem in Manila) punctually started the mass following the agreed-upon sequence of the liturgical program. With the parish priest, Fr. Nilo Batausa, as the other concelebrant, Fray Real presided the mass and gave the homily. The rite of healing was performed after the mass. Just like in Baclayon, there was no scheduled mass on August 18 at Our Lady of Light Parish Church. 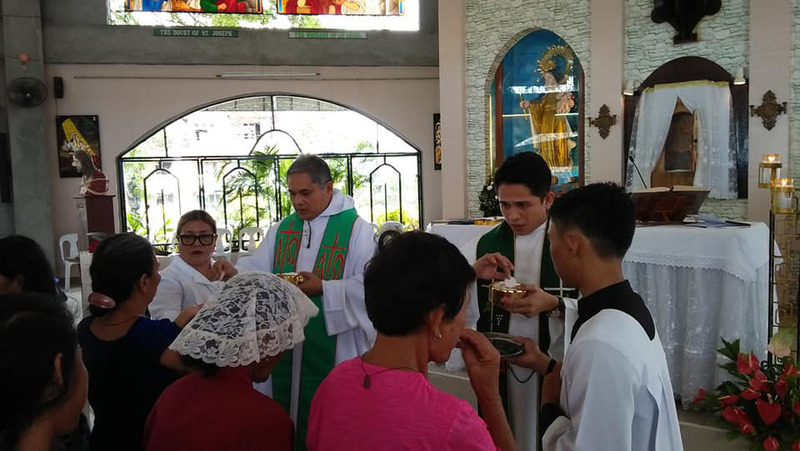 The next day, August 19, Frays Domingo Saladaga and Michael Dineros celebrated the 8:00 AM solemn mass with the people in a temporary edifice for worship since the parish church, once touted as Bohol’s largest century-old church, was leveled to the ground by the 2013 earthquake. “It was the first time that people there heard of St. Ezekiel Moreno,” Fray Dineros recounted. The parochial vicar, Fr. Darwin Anober Gitgano, a known debater against Iglesia ni Cristo, concelebrated with them. Fray Saladaga was the main celebrant and homilist. They also officiated the healing rite after the mass. On August 18, the 6:00 AM mass at the makeshift church of the Holy Cross Parish was presided by Fray Edgar Tubio with four concelebrants: Fray Michael Dineros, Fr. Gerardo Saco, the parish priest, and Fr. Crisostomo Crisostomo, Jr., first cousin of Fray Dineros. Fr. Saco, who was once the parish priest of the nearby Calape parish where Fray Dineros was among his sacristans, received the image of St. Ezekiel on behalf of the parish. As in other parishes, the healing rite after the mass was well participated in by the people. 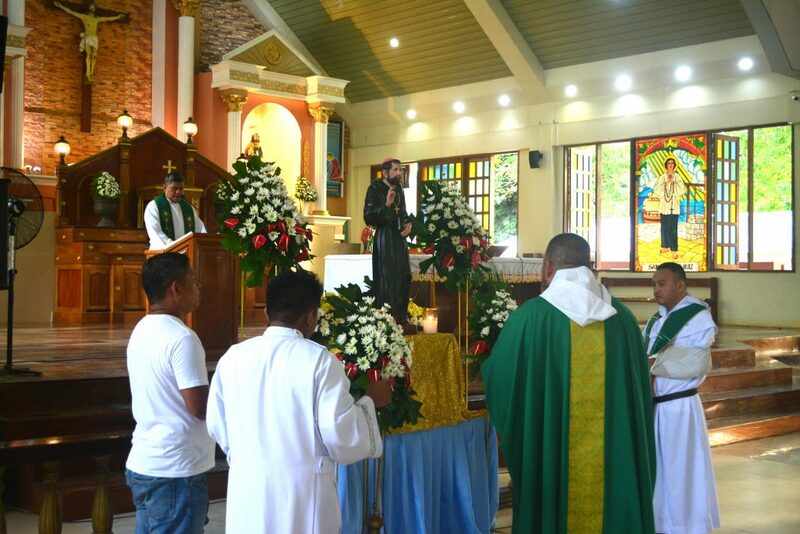 The following day, August 19, Fray Jerome Virtudazo presided the 8:30 AM mass, with the parish priest as concelebrant. Again, another rite of healing was done right after the mass. 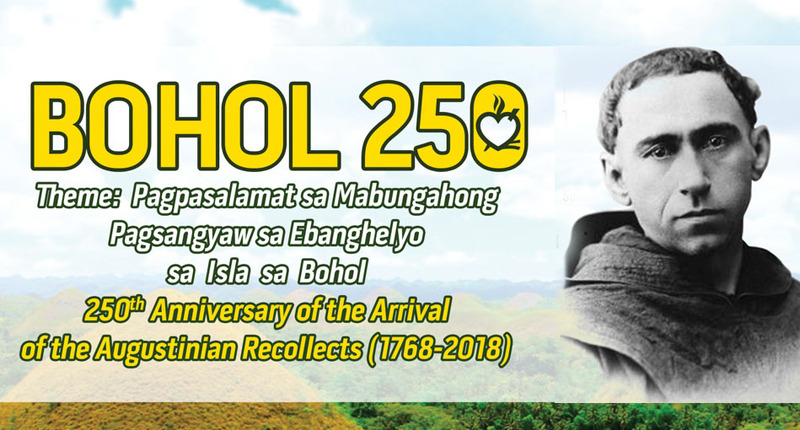 With the success of the celebrations, the Recoletos family and the people of Bohol look forward to another 250 years of blessings. By then, the devotion to St. Ezekiel Moreno and the knowledge about those holy people who once toiled in this island shall have spread far and wide. Congratulations our dear Recollect Fathers!